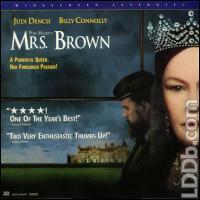 Mrs.Brown,US RELEASE ON APRIL 22,1998. STARRING: JUDI DENCH, BILLY CONNOLLY. DISC IS IN EXCELLENT CONDITION. JACKET HAS SMALL SEAM TEAR AT TOP,OTHERWISE LOOKING NEW.FILM CREATED CIRCA:1997. Disc and cover are in good shape. spine has 1 inch split.